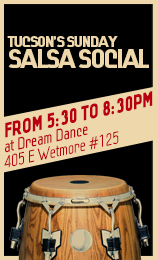 Cuban-style salsa can be danced either "on one" or "a contratiempo" ---the latter is often referred to as "on two". An essential element is the "cuba step" (also known as Guapea), where the leader does a backward basic on 1-2-3 and a forward basic on 5-6-7. The follower does the same, thereby mirroring the leader's movement. Another characteristic of this style is that in many patterns the leader and follower circle around each other. This is a style of salsa much influenced by Hollywood and by the swing & mambo dances, thus being the most flashy style, which is considered "more show than dance" by many. The two essential elements of this dance are the forward/backward basic as described above, and the cross-body lead. In this pattern, the leader steps forward on 1, steps to the right on 2-3 while turning 90 degrees counter-clockwise (facing to the left). The follower then steps forward on 5-6, and turns on 7-8, while the leader makes another 90 degrees counter-clockwise. After these 8 counts, the leader and follower have exchanged their positions. The "NY Style" is a combination of the "On 1" and "On 2" systems. The timing of the steps are on the 1-2-3,5-6-7 as in "On 1" but the breaks (where the body changes direction) occur on the 2 and 6 as in "On 2". NY instructor Eddie Torres developed this step pattern around the late '70s and the '80s, and its definition is quite clear as he is still alive and his followers are keen to keep the style intact. This is their description of the step: Description of "On Two" on salsanewyork.com There are many "socials" in NYC or nightclubs that dedicate on playing only mambo or salsa. This style is similar to Los-Angeles style, but it is danced "On Two". The basic step timing is 2-3-4,6-7-8 with the breaks on 2 and 6. It is important to note that although this style is also known as dancing "En Clave", the name is not implying that the step timing should follow the rhythm of the Clave as in 2-3 or 3-2. It only means that you take the first step (and break) on the second beat of the measure. This does indeed follow the 2-3 or 3-2 pattern of the clave, e.g. for the 2-3 clave the leader steps forward with the left on 2 and with the right on 3, then does the other 4 steps of the basic on 5-8 (syncronizing with the clave on 5 and 8 ). It's a traditional form and it's less known/used outside some Latin countries. This style can be danced as "On One" or "On Two". If danced as "On Two", it is always danced on count 2, and not on count 6 as in Ladies-style NY. In the 1950s Salsa Rueda (Rueda de Casino) was developed in Havana, Cuba. Pairs of dancers form a circle (Rueda in Spanish), with dance moves called out by one person. Many of the moves involve rapidly swapping partners.